The elk were apparently confused by the exceptionally warm weather (before we got there, that is) and were late coming down out of the mountains for their mating season. 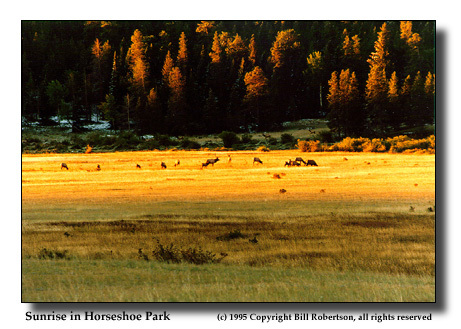 I was out early one morning and saw this herd grazing peacefully in the meadow. The bull in the middle of the herd is ignoring some batchelors hanging around in the back. One cow, facing away from the camera, is not. Once the sun came out, they all made their way into the forest within another ten minutes.